Originally known as El Toro, Lake Forest is a city that respects the natural environment. The abundance of green parks, numerous trees and a beautiful lake are evidence of this. Although Lake Forest is a new City, having incorporated on December 20, 1991, the Lake Forest area has a long history. 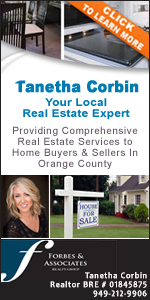 Starting out as an agricultural area like most of Orange County region. "El Toro" was a stagecoach stop between San Diego and Los Angeles in the 1800s. After World War II, the El Toro Marine Base has helped shape the city's development - residential, commercial and industrial growth began to replace the acres of citrus and other agricultural products. To preserve its past, Lake forest established an area of the city known as Heritage Hill. The first of Orange County's historical parks, it is the home of Serrano Adobe, built in the late 1880's and known as the oldest structure in the area. Cañada de los Alisos, also called El Toro, was granted to José Serrano in 1842 by Governor Alvarado. Senor Serrano and his relatives erected a number of adobes on the grant, one of which still serves as private living quarters.